My husband and I are big fans of Alaskan Halibut Steak. I usually sautee it with just salt, pepper, and little bit of dry herbs. Sometimes I prepare it by putting a bread crumble outside before I cook it. The last time I put Buckwheat Tea into the bread crumble and sauteed the fish. That was a big hit!! 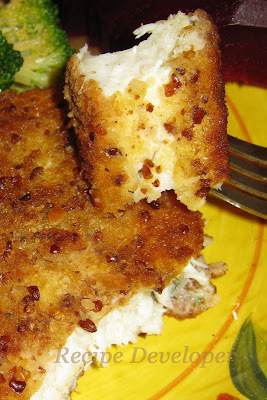 It turned out great because of the crispy, crunchy breading with a subtle taste of Buckwheat which blends perfectly with the delicious Halibut Steaks. I liked this idea very much, because I am able to create a Western dish like this sauteed fish using SOBA-CHA ( Buckwheat Tea ), which is normally a Japanese ingredient. I would like to create more dishes like this combining Japanese and Western ingredients together.